The Cleopatra slot machine is a high-octane ride which offers players great bonuses, in-game features and jackpots. The title has been around for some time but it is proving to be a classic game with ever growing popularity. The title originated from the IGT platform and has changed very little since it was created, the software company did attempt a second version, Cleopatra 2, but this title did not receive the same success even though it is a great slot in its own right. Cleopatra is known for its high spin rate, the platform powering the game is flawless and there is virtually no lag or waiting time between spins, this can dramatically increase the excitement of the game and is relatively unique in regards to speed. The £10,000 jackpot is also one of the slots’ main attractions, this is triggered by 5 Cleopatra symbols, however, smaller amounts are paid for just revealing two. The Cleopatra symbol also doubles up as a wild icon, this can replace the majority of symbols and doubles their pay outs for winning combinations. The Cleopatra symbol cannot substitute the scatter symbol which is shown in this game as a Sphinx. The Cleopatra free spins bonus is triggered by three or more scattered Sphinx symbols. The sound when they land has a unique “twang” which is instantly recognised by Cleopatra players from all over the world. Two scatters will double your initial wager. We usually hate slots that don’t award credits when only two symbols show up on the reels. We feel you should always have a winning sensation or at least some form of consolation prize when you get close to, but just miss the bonus. The main bonus kicks in when three or more Sphinx scatters are on the screen. The player will then be taken to a new set of reels and is awarded 15 free spins at a 3x multiplier. The free spins bonus hosts the same pay lines as the original reels but players are not charged per spin, once it has been completed a player will return back to the standard reels and receive their bonus winnings. The Sphinx scatters will also pay out depending how many are brought into play, this will dramatically increase your overall winnings – matching 5 symbols will bring in 100x payout against your initial wager. 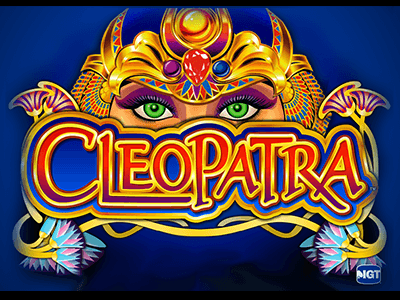 The in-game features aside from the free spins all revolve around the Cleopatra symbol, firstly these icons host the jackpot payout of £10,000 but can also double payouts if present on a winning pay line. To help players make the most of the Cleopatra symbol it has been transformed into a wild which substitutes most icons apart from the Sphinx scatters. Aside from the two features, the slot operates in a similar manner to other titles, revolving around matching similar icons in exchange for cash payouts. The IGT-based Cleopatra slot is certainly heading for legendary status, its growing popularity is being recognised by both online casinos and software providers. Competitors to the IGT brand are struggling to recreate the success this title has had. There are loads of casinos offering exclusive free spins and welcome bonuses to this slot which can dramatically improve the players experience. Although Cleopatra doesn’t really stand out with its graphics, gameplay or bonuses, it does all come together in a perfect way. Cleopatra is a medium variance slot that just oozes fun and excitement. Every free spin bonus will take you into an adrenaline filled feature and will have you wanting more.